Quesadillas are like the boys I used to date before meeting Mr. How Sweet. I enjoy them, but I get bored so easily. I am always thinking up new flavor combinations. They often go like this: some form of meat, multiple cheeses, tropical fruit, and as few veggies as possible. And they almost always include bacon. See, I had fully intended on providing a proper side dish with this quesadilla. It may have been chips. It may have been a margarita. It may have been as simple as a tequila shot. Whatever it was, to Mr. How Sweet, fruit slices do not a side dish make. But then I nabbed a bite of the mango. It was the best mango I’ve ever had. Let’s just say that in Pittsburgh, mangos aren’t… plentiful. Finding a good one is like finding a needle in a haystack. Or a veggie in my crisper drawer. And I haven’t really ventured anywhere tropical. Unless you count the Jersey Shore to be tropical. Clearly, I don’t get out much. After I polished off the quesadillas and mango slices, I stood over the sink chomping on the remaining fruit like it was corn on the cob. The juices ran down my arms and I couldn’t have been happier. While the mango with chili powder is a fabulous combo, the other additions to the quesadilla are what got me all riled up. Bacon for a savory bite and caramelized onions for more sweet, meshed with a melty, spicy cheese. Now I have sank into a deep, dark depression because I doubt I will be able to find a mango as luscious. Luscious – isn’t that a terrible word? It makes me cringe. But it is the only word that appropriately describes the mango. If you know what’s good for you, you will make this quesadilla. Today. Preheat a skillet on medium heat. Lay 1/2 ounce of cheddar cheese on a tortilla, topping with 2 ounces chicken, half of the mango and onions, and a 1/4 teaspoon chili powder. Add 1/2 ounce of pepper jack cheese on top and lay tortilla on top. Add to skillet and heat until tortilla is crispy and cheese is melted. Repeat with remaining ingredients. I’m now going to grieve for my mango. I will probably eat my emotions. And that eating will probably include bacon. Fitness Kick Start: At Home Circuit Blast. Mangoes would be the last thing I would have thought of to put into a quesadilla but the look fantastic! 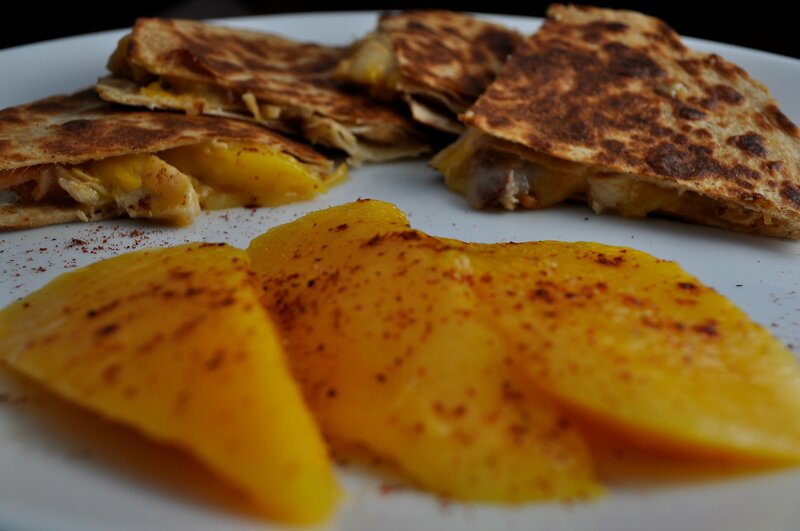 I might just have to give this a go..
your quesadilla’s look incredible….I would have never thought to have added mango…..it sounds delicious! Yum Jess…these look wonderful. I could do some emotional eating with these. I really like the idea of this flavour combination! Great job! Love Mr. How Sweet’s comment! I love your blog and your obsession with bacon, it’s sooo addictive! Mangos are something that I could eat daily. Juicy, sweet, plump and tropical. Yummy yummy yummy. I could drink them right now. I love how you always combine sweet and savory ingredients! I don’t eat chicken, but cheese + mango + spicy = awesome sounding combo! Mangos are one of my favorite fruits and they are so perfect this time of year. And make this quesadilla lok superb!!! I loooove Mangos!!!!! I wouldn’t have thought about putting them in a quesadilla but that looks tasty! Mangoes are very hard to come by in MN, but well worth the price for a good one! I had never thought to put them in quesadillas.. i like it!! Oh my word that scares me. Yet excited me at the same time. Umm yeah, these could be my new favorite quesadillas! Love mangos, but never thought to pair it with some chili powder. Thank you so much for sharing!! I think I’m waiting til my hubby goes out of town to make this so I don’t have to share. YUM! I would have never thought of this combo! Yum! Yum! I love sweet and savoury combinations. And really, mango is so great that it goes with EVERYTHING! Very interesting combo… I’m intrigued! I’m not normally a big mango person, but I will have to give this a try. I get pretty bored with quesadillas, too. I love the flavor combos! The heat with the mango, YUM! This was incredible! Even my never-try-anything-different boyfriend loved it and ate the whole thing. Delicious:) Thanks! um…yum! im new to the mango chicken combo and LOVE it! thanks for sharing this…looks great! I just posted my version of this on my blog … thanks for the amazing flavor combination idea! so delicious! The chili mango chicken quesadilla i looks so freaking awesome. LOVE this recipe!